St Columbanus! Irish Patron Saint of Motorcyclists. Happy St. Patrick’s Day! According to the Vatican and the Harley Davidson company who made a medal promoting him, the Patron Saint of Motorcyclists is St. Columbanus of Bobbio. Despite the Italian ‘Bobbio’, this guy was an Irish dude! What a surprise! During the dark ages when the Irish were saving civilization and Christianity he ventured away from Ireland wandering up and down Europe in the sixth and seventh centuries, starting monasteries and spreading the word about Christ. But who was this man? How do we know he was Irish? Apparently what cinches it is that that we know he lived at home with his mother into his 30’s, he wasn’t married, and he didn’t have a job. Ha ha! (Old Irish joke). If Columbanus were alive today I imagine him riding a Harley Fat Boy. The Fat Boy is a living legend. Arnold Schwarzenegger rode one in “Terminator 2”. Its got a 1,584cc pushrod V-twin engine, six gears, massive torque and you’ve got to love those shotgun-style tailpipes. It’s nimble, has no saddlebags and is perfect for itinerant monks flying around on those twisty heathen roads in Europe. Combine all this with Christianity and you can’t be beat! Love and a Fat Boy can conquer all! I like what the Monk Jonas wrote in the seventh century about Columbanus. My Book is Published! Hope Bats Last. Cross Country Motorcycle Trip. I finally have my latest book, Hope Bats Last, published on Amazon, available as an eBook. You don’t need a Kindle to read it! On the website you can download a Kindle app for free, enabling you to read it on a variety of devices from PCs to phones to tablets. It is a stand-alone book, meaning that you haven’t had to read the previous novels to know what’s going on in this one! Please support struggling independent artists! Hope you enjoy. Here’s the blurb. Twice widowed, recently retired, and now an official senior citizen after turning 65, Rory Conner wants to take one last motorcycle journey across the USA. 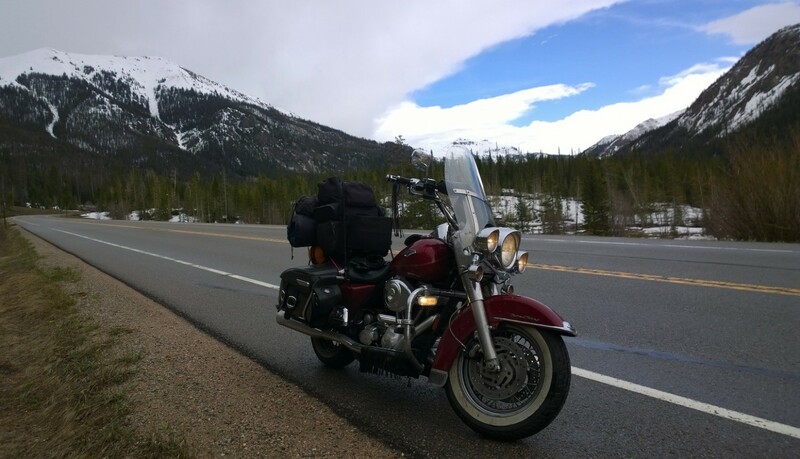 The former detective and child protection social worker wants to ride Big Red – his old Harley Davidson Road King – from Georgia to California. His plan is to take only the blue highways, the back roads, and leave all of the other decisions to chance, fate, and Divine Providence. His son and daughter aren’t happy about his trip. He’s been forgetting things lately, won’t use a GPS system, nor will he plan his route. His son worries about his dad getting lost. Rory replies. “It’s California son, a big state. Even I can’t miss it.” What could possibly go wrong? Rory’s sojourn takes him across the Mississippi River a few more times than necessary and he encounters murder, mayhem, mechanical problems, and romance along the way. He finds himself calling on his detective and child protection skills one last time to try and save a child’s life. Will he make it to California? Is this his last ride? And what does it mean that “Hope Bats last”? Trusting Your Journey: Part Two; Why Bad Things Happen to Good Motorcyclists? Yada, yada, yada. I’m back safely in Rome, Georgia again. I did over 1100 miles on the bike and paid my usual financial offerings to the altars at the Harley dealers. But back to where I left off in the previous entry. Well first of all, I did get down to the Hog’s Breath Saloon in Destin the other night as I had hoped. The beer, a local lager, was delicious, the music great and I watched some very “happy” women dancing. As we say in the south: It was a hoot! The next day I drove 2 hours nursing poor, leaking, Big Red to Dothan to the Harley dealer because they had the part that I needed to fix the bike. I had arranged again to meet my friend Kelly there. One of the seductions with “Trusting your Journey” is thinking that your journey is always about you. Don’t flatter yourself! Sometimes your journey is intended for others. In this case because my friend was meeting me at the Harley dealer she ended up running into an old friend she hadn’t seen in quite a while and it enabled them to have a bit of “closure” in their relationship. So maybe that’s what this was all about? Or it could be about me getting to see my friend again and having more oysters, this time at Dothan’s Hunt’s Oyster Bar. Divine providence works in mysterious ways. Frankly, I don’t have a clue. All I’ve been able to figure out with this life is that you try and do your best, treat everyone you meet, without exception, with respect and lovingkindness and just trust that things will work out for the best. As I mentioned in the previous blog, you have to “surrender your mind and ego to the realm of “unknowingness”. I hate that. Sometimes you get motorcycle breakdowns, sometimes you help other friends to reunite and sometimes, if you’re lucky, you get oysters. 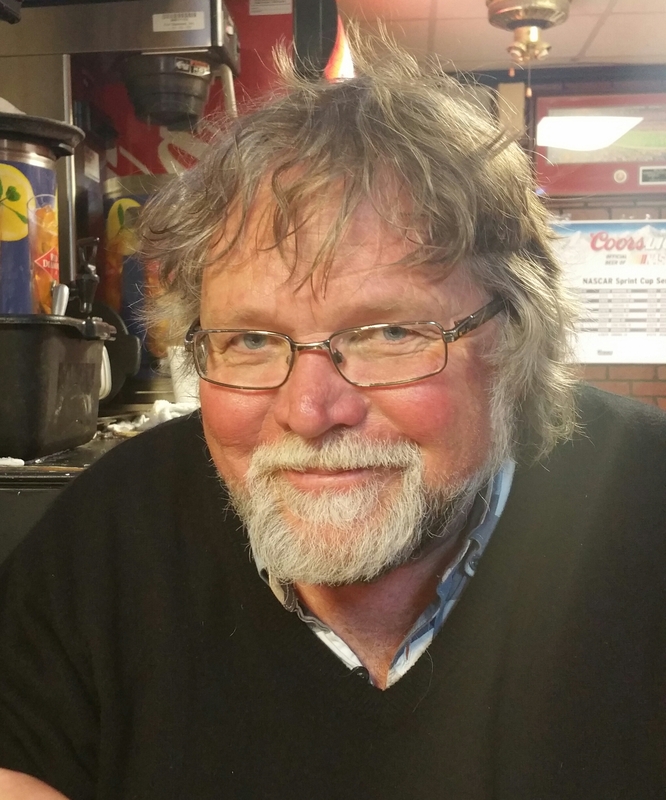 Trusting Your Journey: Part One; Why do Bad Things Happen to Good Motorcyclists? Abandonment to Divine Providence? Why Are You Reading This Now? Caution: This blog entry contains spiritual questions. Enter at your own risk. What does it mean to “Trust Your Journey”? I’m not sure I really know. Every time I try to describe it I get muddled down in motorcycle metaphysics. It starts as a nice ride down a well maintained street then after a while I hit potholes and gravel. To fellow Christians, Trusting Your Journey might mean: Trust in God. Muslims certainly preach it. And so does Judaism. If you are a Taoist it means trusting the flow of the Tao. Buddhism believes in living in the here and now. I’m sure most religions believe in the idea. But what does it really mean? Trust your journey and good things will happen to you? Nah, we know better. I bought a friend a beer the other day and told her she could buy me one someday when I’m destitute. She said: God won’t let you get that way if you trust Him. My response was: Why not? Maybe that’s what God has in mind for me. I asked her: Yeah, well how come bad things happen to good motorcyclists? –A question that every motorcyclist asks at some point or another in their riding career. There have been a number of books out on the subject of why bad things happen to good people. So essentially, let me see if I have this right- I have to believe that the bad things that happen to me are really, essentially good for me? Yeah, right. Tell that to Job from the Hebrew Bible. God totally wrecked his motorcycle journey. And this motorcycle problem I’m having now? How is it good for me? Well, it did throw off my schedule yesterday and caused me to be places where I probably wasn’t going to be. I met some interesting folks last night that I probably wouldn’t have met. It caused me to stay an extra night in Destin. I do try to abandon myself to divine providence when I ride. My destinations are never absolutely fixed. The only GPS I use is a spiritual one. And most of the time I’m not sure I’m picking up the signal. I get lost a lot. If I like the look of a road or the direction it’s heading I’ll take it. Which explains to some degree why I ended up crossing the Mississippi River 5 times last year when 1 would have done rightly. And why it took me 18 days last summer to make it from Georgia to California by way of Sturgis, South Dakota. I was trusting the journey, trusting Divine Providence, trusting what happened to me. It can feel downright spooky to let go of so much. And it can be mind boggling. For instance, what set of weird circumstances brought you here right now to read this blog? Or me to write it? Heck I was getting ready to walk down to the Hog Breath’s Saloon when something told me to stop and write this now. I would really rather being having a beer right now, thank you very much. Okay. I need to write more about this but first I’m going to go get that beer. What are you going to do? 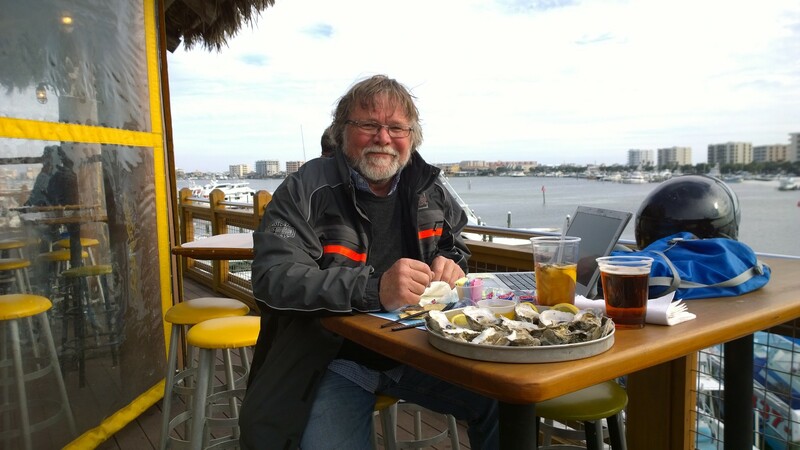 Oysters at AJ’s Restaurant in Destin, Florida: Helmet Hair but Happy! Adventures in Motorcycling: Pub Theology. Have We Kicked God out of the Bars Now? I’ve covered about 500 miles on the bike so far and have ridden through Georgia, Alabama, and Florida in the last two days. Right now I’m hunkering down at the Key West Inn in Fairhope, Alabama. Just back from McSharry’s Irish Pub where I had a really good Sheppard’s Pie and a pint of draft Smithwicks. And for the first time in my life I experienced Pub Theology. Apparently the first Wednesday of the month they bring religion into the pub. But I don’t think this is really necessary. I would argue that at least in the southern part of the United States God has never really left the bar. He’s mentioned in just about every other sentence or at least every other conversation. Come to think of it a woman friend of mine and I were talking about Jesus just the other day in Old Havana Cigar Bar in Rome, Georgia. We didn’t really come to an agreement. I thought He’d be okay with certain things that she didn’t think He’d approve of. Tonight was a bit different. It was more of a lecture by an older man who, along with others, had done some inspirational work in helping folks out. I want to acknowledge that. But frankly, a few other heathens and I decided to head for the smoking area outside. In the southern part of the USA you can’t go far in any restaurant or bar without some kind of spiritual conversation taking place. This morning, a man singled me out at McDonalds (because of my biker gear) and spoke to me about motorcycles and Jesus. I enjoyed the conversation though I didn’t agree that Jesus had a preference for Harley engine modifications made by the Screamin Eagle Company. Yesterday, In Dothan I met up with a friend at the Waffle House and we talked about Buddhism and she gave me a Tibetan Buddhist charm for my motorcycle. Though I consider myself a Christian I acknowledge contributions and insights from other religions. On my motorcycle I have a medal from St Columbanus, the patron saint of motorcycle riders. The medal reminds me to be reverent in my travels. I also have the Taoist Yin Yang symbol on a bracelet attached to my mirror to help me remember to be balanced and to trust the journey. Now I have a Buddhist charm to remind me to stay in the here and now and to show loving kindness and compassion to everyone I meet. I also have a hula girl which is there to remind me to not take myself too seriously and to be silly sometimes. The south in the USA is Christ Haunted so expect Him to pop up not only on Sundays and Wednesdays in the churches but also in conversations anywhere, from the gas station to the bowling alley. And definitely, definitely in bars. The folks from Northern Ireland have a great expression: I need to get my head showered. Essentially, it means – I need a break. I need to get away from everything. That’s where I am right now. Between work and the weather and women, I need to escape. And I need to just head in a certain direction and leave things up to fate/God/the Universe or as the Chinese say: Yuanfen. So that’s what I’m doing tomorrow. I’m heading in the general direction of the Gulf of Mexico and I figure that even a pretty disoriented guy like me can still manage to hit that. After all, it’s a pretty big target. I’ve just finished writing my latest book. Normally, after I complete one I feel lost, disoriented, have orbit and reentry problems. I hope to get it up on Amazon soon and I hope that you’ll like it. It’s called: Hope Bats Last. It’s about an older man who may or may not have Alzheimer’s and who’s making one last cross country trip on his motorcycle. It’s got the usual mayhem, romance and murder in it along with a man who’s leaving his travels to fate. Probably sounds familiar. I’ll keep you posted.